Venison meatballs as an appetizer taste-tester and also displayed as a dinner serving suggestion over rice with green peas. Gail Spear. She volunteers at the Island Food Pantry, it’s one of the non-profits on Martha’s Vineyard that provides food for people in need. Gail Spear, a volunteer at the Island Food Pantry, recipe-tested the donated ground venison and offers samples. More than 11% of the Vineyard’s year-round population lives in poverty according the U.S. Census Bureau. The Island Food Pantry served over 450 households in the last year, that’s nearly 1,000 adults, children and seniors of the roughly 16,000 people who live on the Vineyard. Gail’s meatball recipe uses ground venison that was donated by local deer hunters and includes some other ingredients that are also available at the Food Pantry. Her seasonings include scallions, garlic, soy sauce, ginger and red pepper flakes. There are a lot of moving parts to this Venison Donation Program. It’s in its second year and is a collaborative partnership between nonprofits like the Island Food Pantry, the Martha’s Vineyard Agricultural Society, Island Grown Initiative, and the MV Tick Program, which runs out of Dukes County. The towns’ Boards of Health play an important role too. This season, there’s a new community deer cooler that was made available to all the hunters who wanted to take more animals and that made a big difference in terms of the quantity of donated venison that went up from 200 pounds last year to 350 pounds this year. 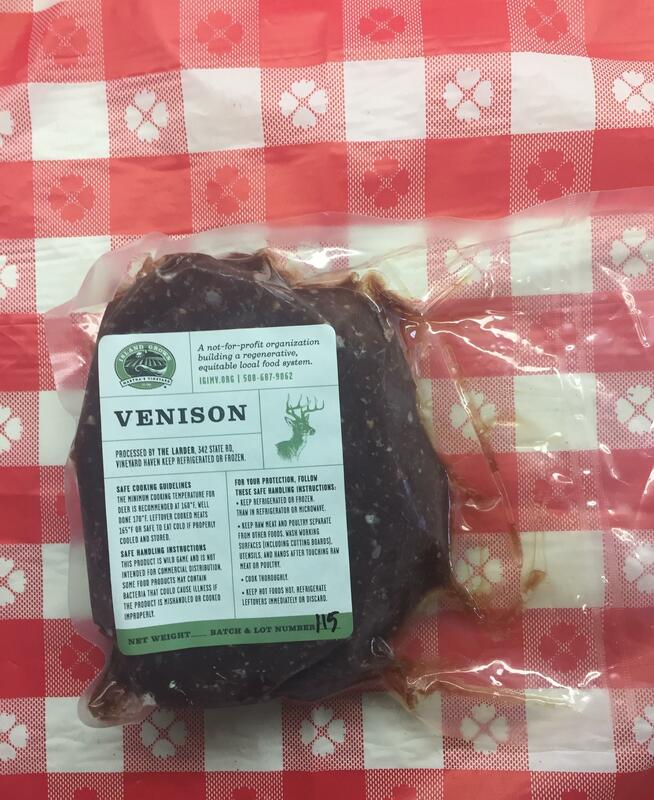 The donated venison from Vineyard hunters comes packaged in frozen one-pounders. This meat won't be for sale due to government regulations. 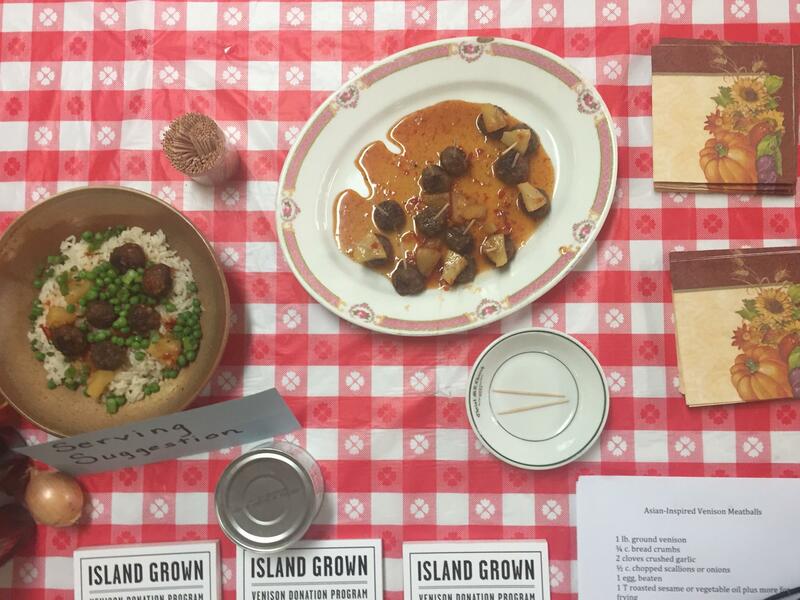 Back at the Food Pantry, Gail was serving meatballs with a chili sauce and a bit of pineapple as an appetizer, to show clients how they delicious they are and how to make them at home even as a full dinner served over rice with peas to add flavor and pop. So far everyone who’s tasted it has had great things to say. From the community deer cooler, the meat gets taken to a local business where it’s butchered and ground up in a commercial kitchen. Then it’s packed and labeled according to board of health requirements and distributed out to the Food Pantry in frozen one-pound packages. It won’t be sold because of government regulations. “It’s a wonderful program and I know that the people who are working on whatever initiatives they can to reduce the tick population are also very supportive of this program as we bring down the deer population and provide good food and hopefully fewer hosts for the deer ticks,” Gail said. And taste tests and recipes that use ingredients that the Food Pantry has to offer help out the cause too. Gail explained that a lot of people are really familiar with venison because they’ve grown up on the Island, so they’re really delighted to have it, but there are also people who’ve never tasted it before. In terms of a taste of place, this venison is it. It’s wild, professionally handled, and totally traceable right down to the hunter. The meat is flavorful and satisfying. There may be a lot of moving parts to this program but it’s hugely successful in its specific aim to address two public health issues: food insecurity and the pervasiveness of tick-borne illnesses. I asked Kayte Morris, the managing director of the Island Food Pantry, what advice she has for other communities who’d want to start a program like this? Here is a link to the Venison Donation Program. Mix all ingredients together, kneading with your hands. Form mixture into 1 inch balls. Sauté in sesame oil. Drain on paper towels. Toss with glaze and serve hot with toothpicks as an appetizer. PANTRY GLAZE: Mix 1 ½ c. ketchup w/ ¾ c. grape jelly. Add pineapple chunks. Season w/red pepper flakes. Serve as appetizers or, as a main dish, add frozen peas and serve over rice.